Today it has been snowing tiny ice pellets, which is just depressing. This morning, it was almost like tiny hail, but now it's kind of snow pellets. It needs to stop. Thank God we're going to California soon. Today is day two of Lotus' sippy-cup boot camp. I finally realized that if I stop giving her bottles, she'll eventually get the hang of this cup business. And it's working... not that she hasn't put up a fight now and then. She's such a sweetie and it's so awesome to hear the words she's been starting to say... "pretty," "dude," "mama" (finally - and she doesn't say it often, only if she's in distress.) And "bah" which means "bye," which comes out sounding almost like she's from the South. 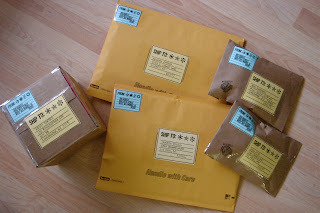 And in other fun news, I finally packaged up some goodies to send out to The Dares girls. Which is so exciting. Kristina asked me to be a guest designer in April and to come up with a dare! Which is too rad for words. So I sent them all some Etsy love from my shop, which they'll use on their page for the Dare that week. And more of my Etsy stuff will be included in the April Red Velvet kit, which comes out soon. Check it!